American reluctance to enter the war was abandoned on 6 December 1941 when the Japanese Navy bombed the Hawaiian port of Pearl Harbor. The American Pacific Fleet was destroyed in a matter of hours and America was at war. Canada declared war on Japan the very next day, despite the fact that it had already taken steps to counter Japanese advances in East Asia. In November 1941, more than a thousand Canadian troops arrived in Hong Kong to shore up British, Indian, and Chinese troops in the event of a Japanese attack. On 8 December, the Empire turned its attention to the British colony, confronting Canadian troops for the first time on 11 December. Two weeks and 290 casualties later, the Canadian troops surrendered, along with the rest of the Allied forces in the area. The Canadian soldiers would spend the remainder of the war in notoriously brutal prisoner of war (POW) camps where another 267 died. Canadians would play only a marginal role in the Pacific War thereafter, even though Japanese submarines were found patrolling the waters off Nootka Sound where they shelled the lighthouse at Estevan Point. Figure 6.23 Canadian prisoners of war (POWs) in the aftermath. A stunning failure: the Dieppe Raid tested German coastal defences at the expense of Canadian troops. After the hopeless task of defending Hong Kong, Canadian troops wouldn’t see action until 19 August 1942. The Dieppe Raid was meant to test resources, probe German coastal defences, and gather intelligence. Five thousand Canadians — many of them desperately bored after two years of being stationed in Britain — were sent ashore along with 1,000 British troops and a handful of American Army Rangers. They had inadequate air cover and their understanding of the terrain and its obstacles was entirely inadequate. They were instantly pinned down by sniper fire and unable to advance or retreat. More than 900 of the Canadian contingent were killed and nearly 2,000 captured; among those who made it back to the ships, a significant share was wounded. Losses totaling nearly 3,000 came as a terrible blow to Canadian morale and, although the British justified Dieppe as the practice-run that made the subsequent Normandy invasion a success, for Canadians it was difficult to reconcile. Nearly a year later, Canadian forces got a third crack at the Axis nations, this time in Italy. The Canadian First Division joined with the British Eighth Army in December 1943 and took Sicily in a week, despite strong resistance from German troops. Moving onto the coast of Italy, the Canadians pressed northward, their progress impeded mainly by surrendering Italians. The Italian government capitulated on 8 September 1943 and, in a panic, German dispatched large numbers of their own troops to disarm the remaining Italian forces, seize control of Italy, and block the invading forces. Difficult terrain gave the Germans the advantage. Forward movement for the Allied troops was very slow and bloody. The Germans established a series of defensive barriers south of Rome, and were able to use relatively small numbers to pin down the much larger invading armies then retreat to newly erected barriers from which they would continue their effective harassment. The Allied invasion of Italy, in which Canadians played an important role, became bogged down. The Mussolini government had fallen and the Italian Army was effectively no more; its replacement with an occupying German army transformed the campaign almost immediately from one of conquest to one of liberation. 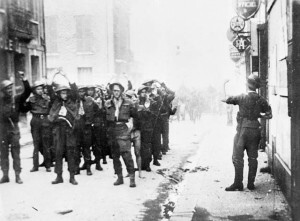 Some 700,000 recalcitrant Italian troops were captured by the Wehrmacht and forced north to work in German labour camps. There was only a small residue of pro-Hitler Italian troops left on the ground. The remaining Axis forces, however, were enough to stall Allied progress up the Italian boot. Victories were scored at Naples and, for the Canadians in particular, at Ortona, but the gains came slowly and painfully. More than 1,300 Canadians from the 1st Division were dead. Building-to-building fighting characterized much of the combat at Ortona and across the German “Gustav Line” that guarded the southern access to Rome. The siege of Monte Cassino — in which Canadians played a significant role — saw a 5th century Benedictine monastery bombed out of existence in an attempt to dislodge German snipers; the rubble provided even better cover for the German troops and the Allied victory, when it came, was purchased at a high price. The Gustav Line was breached and the Germans fell back to the “Hitler Line”; fighting there was quick — the Line fell in four days — but it cost another 900 Canadian lives. It took nearly two years to completely route the German forces and overcome the final barrier in the north of Italy: the “Gothic Line.” This protracted battle saw the heaviest engagement of Canadian Armoured Divisions in the whole of the war; 4,000 more Canadians died in a month of pitched fighting. Oversight of Canadian troops continued to be a point of contention. The British Eighth Army subsumed a Canadian Corps consisting most importantly of heavy armour, which alarmed some Canadian officials. Canadian politicians, diplomats, and field officers were constantly alert to further British and American attempts to bring Canadians under their command. This serves to remind us that the Allied field was dominated, not by the Canadians, but by the Americans (who, in Italy, rolled into Rome with the support of the Free French) and the British (whose battalions were a cosmopolitan mix of colonials, refugees from Poland and other countries conquered by the Axis powers, and members of the local anti-fascist resistance). Canadians moved forward in the field when the larger partners in the Alliance were ready and often had to wait patiently while the Americans and the British sorted out their different goals and strategies. Rome fell on 4 June and two days later the Allies created a second western front. The Normandy invasions (“Operation Neptune”) constitute one of the most complex and largest military operations ever. Air, sea, and land forces were deployed to soften up German positions, neutralize U-boat and naval countermeasures, and to secure the French shoreline. Five beaches were targeted and the Canadian forces focused on a 10 km stretch between the towns of Saint-Aubin and La Rivière, code-named Juno. As Second World War battles go, this was Canada’s finest hour. The German defences at Juno survived the preparatory air assaults and the beach was bristling with obstacles. In a matter of hours, however, Canadian troops had overrun Juno and were pressing further and faster inland than either the British or the Americans. More than 1,000 Canadian casualties and missing troops constituted a significant loss but expectations were much worse. And, indeed, there was worse to come. Largely inexperienced Canadian infantry fought battle-hardened German troops and armoured divisions and they did so with inferior weaponry and inadequate relief regiments. Exhausted, they nevertheless pressed on along the French coast, liberating ports — including Dieppe, the scene of the disastrous assault in 1942, and Dunkirk. As the battle across Normandy — “Operation Overlord” — made its way south and eastward, Canadian troops were to prove their worth and to take severe losses in several confrontations with an increasingly desperate Wehrmacht. The liberation of the Netherlands was principally a Canadian task, as was dislodging the German positions in the Scheldt Estuary (the Battle of the Scheldt), which opened badly needed Allied supply lines through Antwerp. At the Falaise Gap in the second week of August 1944 the First Canadian Army launched “Operation Totalize,” which involved unusual and high risk nighttime tactics that won the goal but cost much in lives. None of the German positions were easily cleared and matters worsened in the cold and wet winter of 1945 as Allied troops pressed into the Rhineland. A German counterattack caught the British and American leadership napping, leading to the “Battle of the Bulge.” In response, the largest force under Canadian command launched “Operation Veritable” into the Reichswald and Hochwald Forests, followed in late February by “Operation Blockbuster” that routed the German defences. Canadian and other Allied forces now had a clear route on German territory. Two months later the “Thousand Year Reich” was finished. Canada followed the United States into the war against Japan, although its commitments in Hong Kong already put it in the crosshairs of the Empire. Losses in Hong Kong marked the effective end of Canada’s role in the Pacific. Thereafter efforts focused on the European theatre. Major Canadian operations include the failed invasion at Dieppe, the Allied invasion of Italy, and the D-Day attacks on the Normandy coastline. 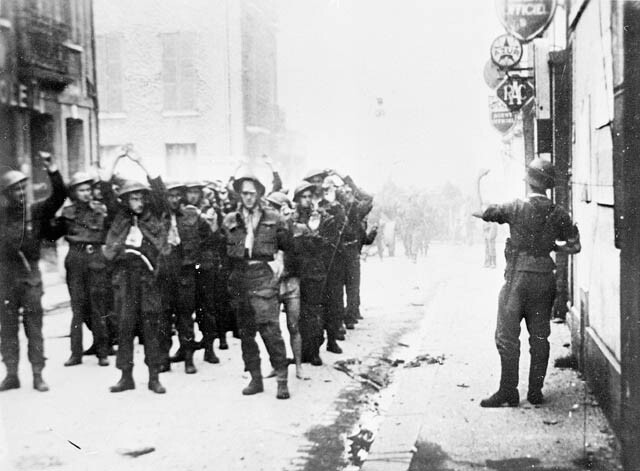 Canadian prisoners of war being lead through Dieppe by German soldiers (Online MIKAN no.3194292) by Library and Archives Canada / C-014171 is in the public domain. 6.14 Global War by John Douglas Belshaw is licensed under a Creative Commons Attribution 4.0 International License, except where otherwise noted.